Andrea holds a combined Bachelor and Master degree in Law at Bocconi University. All along his academic path, Andrea also pursued a 5 years political experience with focus on public finance. After two internships in the banking sector in London in Lehman Brothers (Equity derivatives) and Credit Suisse (Public finance), in 2012 together with Stefano Guidotti he co-founded U-Start, a global boutique advisory firm offering services targeted at supporting private investors (Family Offices and High Net-Worth Individuals) as well as venture capital funds, corporates and wealth management institutions in scouting the best opportunities in digital and tech early stage companies. 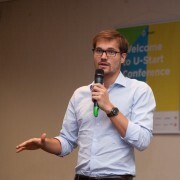 Andrea is now based in Lugano, Switzerland, where he runs the global operations of U-Start as COO. He is also vp of a charity foundation that supports, with finance, other no-profit organizations.